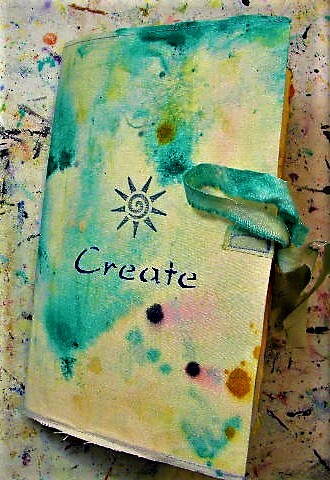 I love making stuff, and experimenting with materials, mostly paper and fabric. I hand “painted” the muslin cover with acrylic paints and alcohol inks, let it dry, and then I ironed it flat. I used a manila folder that I cut to size to fit the pages I made. I also made sure the muslin covered the inside of the cover. I got lucky because it did! Then I proceeded to deckle the edges of 34 sheets of card stock in various colors. 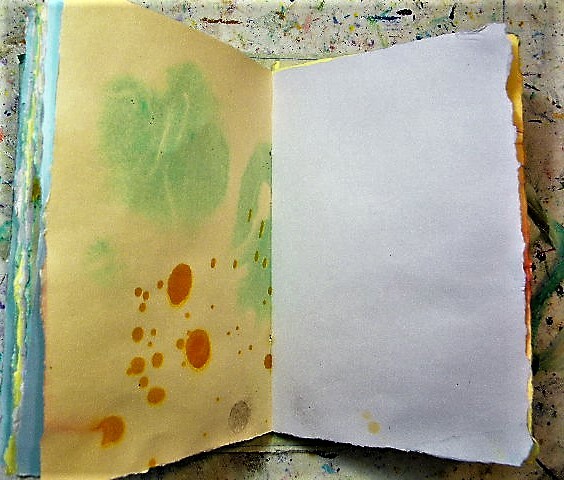 I then wet all the pages and dribbled or poured paints and inks on them, and the effect is always fun when paint runs in the water. 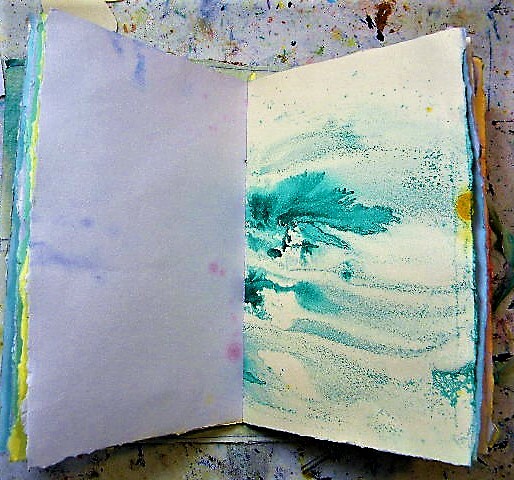 It is very rewarding to make your own journal, to be part of the entire process of making it your own and then filling it with art and writing. 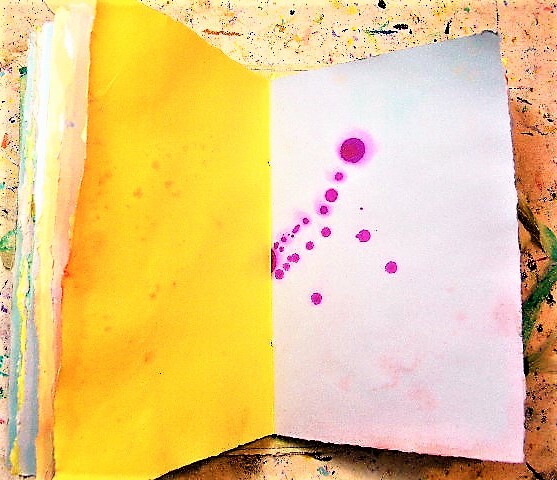 Modern day journaling… I think we long for expression, something to keep us in touch with what we REALLY feel. Art is healer and a challenger. Why not go for a wild ride and claim your innate creativity? Everyone is an artist and that’s the truth. Everyone knows how to express themselves, therefore there is an ability to express in art. 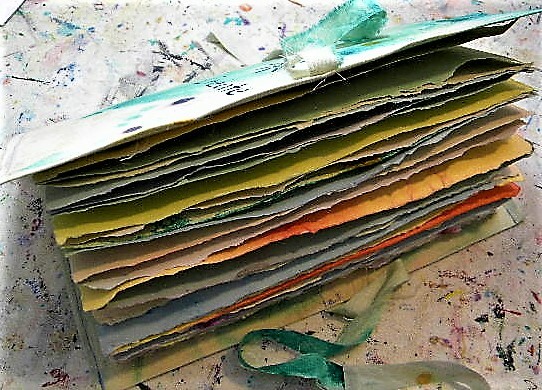 If you want to check out the e-course how to make three different kinds of art journals, go to THIS PAGE. I wish you a great, creative weekend! Hello lovely readers, do you believe in magic? Lately I have been very busy in my studio making “things.” I paint also, and joined a 30 day painting challenge on Instagram that was started by Tracy Verdugo. We are painting on the same painting for 30 days. I’m on day 20 today. You can check out the painting on Insta. My username is @greeneearth. It’s a tough challenge for sure since you might fall in love what you have painted, but you have to let go and keep painting. The rest of the time I have been making faery boxes, intention boxes, and other purdy things, like polymer clay mosaics for my boxes. It has been a month of experiments and it’s SO MUCH FUN! When one art form is sluggish I try something else to get my creative fix daily. Here are some pictures. Follow your heart intention box. 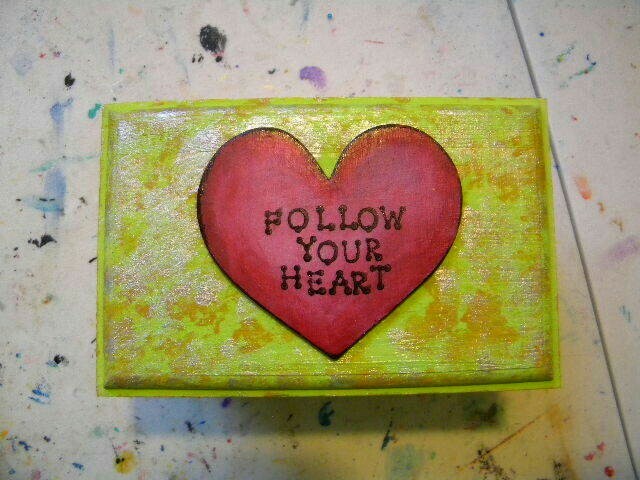 This is a wooden box that I painted with various colors and I attached a wooden altered heart to the top. The inside has a picture of the Buddha and a polymer clay tile that says “believe.” Intention is about setting the course or goal and then believing it’s possible. I used a wooden pencil box for this one, with a wooden flower attached. I used golden beads and glass mosaic tiles to embellish the lid. 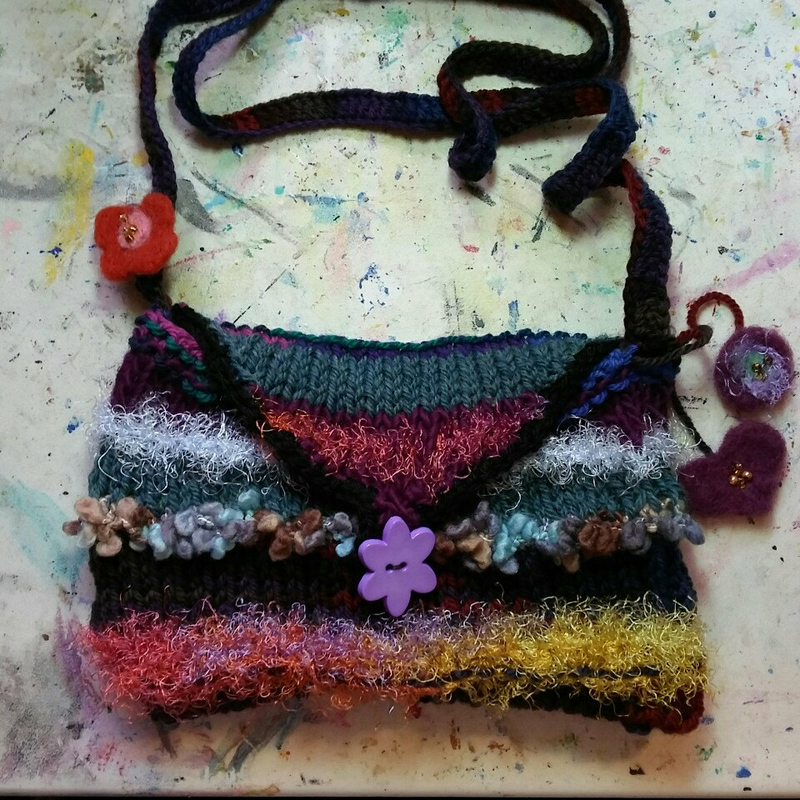 The fairies helped me knit this fun and colorful purse /shoulder bag. Mostly knitted with wool yarn, it also has strands of shiny and eyelash yarns. I needle felted some flowers to attach as embellishment. 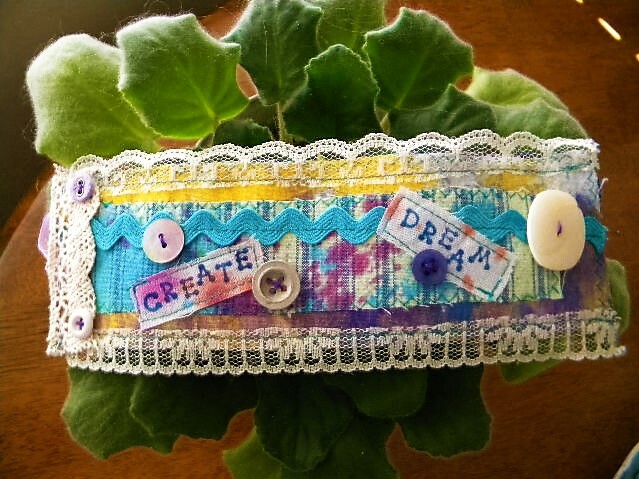 Fabric cuff made with hand-painted scraps of fabric. I hand-painted some fabric with acrylic paints and then made some fabric cuffs just for fun. I have two more but no pictures as yet. I opened a new etsy shop for all of these magical things. It’s called Earth and Faery and it will be filled with inspirational and pretty things. I’m really excited about this new adventure of mine. Earth and Faery. I wish you a creative weekend!